Library building design is planned in the context of the built environment and its effects on communities. 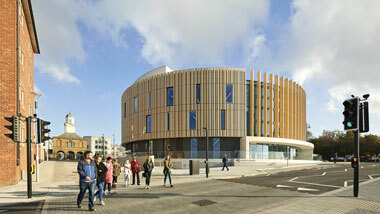 The Building Centre exists to promote innovation in the built environment. First established in 1931, the organisation has since developed to become a not-for-profit dedicated to providing education, information and inspiration to all sectors of the built environment. The Design Commission for Wales is a national organisation established in 2002 by the Welsh Government, to champion good design and a high quality built environment. The merged site for the Design Council and CABE, an organisation offering design support and advice to industry, communities, central and local government. Guidelines on inclusive design, produced by CABE. Covers location and design of a place, management and use of a place, building communities, the economic and social benefits of inclusive design – with many examples, including libraries. New York based with international contributions, PPS is a non-profit organisation dedicated to helping people create and sustain public places that build communities. The website has an image gallery, a discussion forum, a special libraries section, a newsletter and a bookstore. The UDG website contains a wealth of information for anyone interested in urban design, including details of urban design practices, university courses, publications and a newsletter.